An oncology ward at a Swansea hospital will be closed for up to three months following a fire. The blaze broke out in ward 12 of Singleton Hospital at about 21:40 GMT on Sunday. The 36 patients and staff were uninjured but some who may have inhaled smoke are being monitored as a precaution. Services have been moved to another ward while repairs are carried out on ward 12. 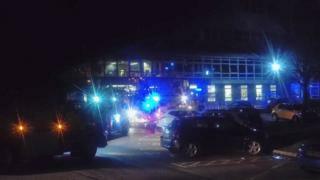 Abertawe Bro Morgannwg University (ABMU) Health Board said circumstances surrounding the fire meant it could not reveal the cause. But a joint investigation between the health board and Mid and West Wales Fire and Rescue Service deemed no further action was required. ABMU's director of nursing and patient experience Gareth Howells praised staff who dealt with the fire, saying they "demonstrated great courage and compassion". "They have been ably supported in the aftermath of the fire by staff across all of our sites, who have worked tirelessly and in unison to ensure the inevitable knock-on effects were kept to a minimum," he said.